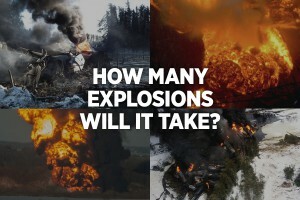 The five major oil train derailments and explosions that occurred less than a month apart in the U.S. and Canada recently has refocused attention on the reckless practice of moving millions of gallons of crude oil at a time on a train through the continent’s communities. 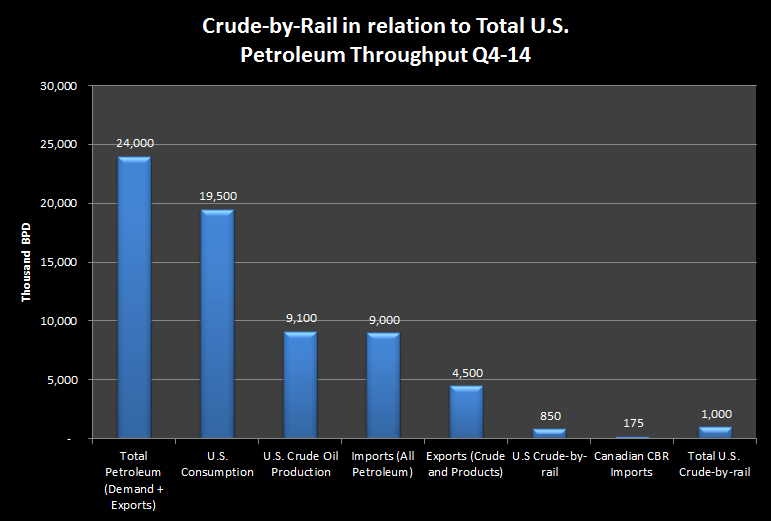 The only sensible and safe position on crude-by-rail is clear. We need an immediate moratorium on crude-by-rail shipments in North America. This needs to stop now. Based on the recent developments and disasters, we now know that nothing short of a moratorium on moving crude by rail in North America is required, until the safety of our communities and climate can be fully guaranteed. The evidence that the practice is unsafe is undeniable. It’s hard to imagine a more terrifying proposition than one of these trains derailing and exploding in your community. It is not a disaster waiting to happen, it has already happened over and over again. That the regulator has still not acted is inexcusable. Before we go into the details of what it would take to make it safe and why that will not happen without essentially banning the practice, let’s quickly examine what is at stake in terms of U.S. crude oil supply. This is important because it seems that the main reason the Obama Administration has failed to act is because it somehow considers the supply of crude oil enabled by crude-by-rail to be too important to effectively regulate. This is unacceptable in and of itself, but when you see what’s really at stake regarding our community safety and climate crisis, the assumption appears to be beyond comprehension. According to our estimates based on Association of American Railroads (AAR) data, about 850,000 barrels per day (bpd) of U.S. crude oil was loaded onto trains in the last quarter of 2014. In addition, the Canadian National Energy Board reported that around 175,000 bpd of Canadian crude oil was exported by rail to the U.S. in the same period. For simplicity’s sake let’s call it one million bpd. Meanwhile, the petroleum products consumed in the U.S. in the last quarter of 2014 averaged just less than 19.5 million bpd. But 24 million bpd passed through the system as the U.S. exported an average of around 4.5 million bpd, including both crude oil and refined products. In fact, while some pretty wild claims have been made about the current oil boom leading to “energy independence”, the U.S. still imported over 9 million bpd of crude oil and products in the same period. So given the enormous amount of total petroleum passing through the U.S. system, what would be the impact of banning crude-by-rail immediately until we can work out whether it’s worth risking another disaster? The answer is not very much. Crude-by-rail accounts for 4.1% of the total petroleum moving through the system (consumption plus exports) or 5.1% of total U.S. petroleum consumption. What about U.S. oil production? That stood at 9.1 million bpd in Q4-14. The 850,000 bpd that went by rail is just 9.3% of that. Source: Oil Change International, U.S. Energy Information Administration, Association of American Railroads, Canada National Energy Board. Note: Difference between Production plus Imports vs. Consumption is Refinery Gains and Natural Gas Liquids entering the refinery system. Any way you cut it, crude-by-rail carries a very small percentage of the oil in our country, yet continues to pose an outsized risk to communities around the country. The build out of terminal capacity suggests that the practice could grow especially if the U.S. crude oil export ban is lifted. This would trigger a rush to move crude to the east and west coasts for export, threatening the communities along the way with much more frequent crude train traffic. Are we really unable to ensure public safety because we’re worried that we may impact the transportation of 9% of U.S. oil production or 5% of our oil consumption? Is government’s role really to weigh the probability of a major death toll against a fraction of energy supply or is it to protect the public? Aren’t our communities and our climate worth more than 1/20th of U.S. oil consumption? Box: Crude oil trains are unsafe, no single solution can solve the problem. Without crude-by-rail, the industry will have to produce only slightly less than it currently does, which is much more than it produced only a few years ago. Is that really worth bomb trains endangering 25 million American every year? The current effort to make crude-by-rail safer through increased regulations is in fact sadly misguided and inadequate. That crude-by-rail is inherently unsafe is painfully obvious. That it cannot be addressed through looking at any single variable, such as tank car standards or the volatility of a particular crude oil grade, was made clear by a Department of Energy report released earlier this week. That report aimed to look at whether Bakken crude oil is more volatile than other crude oil. It concluded that there was insufficient information about the crude oil in the Bakken to assess that at this stage. But in the press release the DOE made an important statement regarding the focus on any one particular cause of the terrifying crude-by-rail explosions that have so far occurred. This goes to the heart of why crude-by-rail cannot be made safe. So there is a combination of things that could be done to prevent derailments and/or the occurrence of explosions and fire in a derailment; e.g. stronger tank cars, shorter trains, slower speeds, less gaseous crude among other things. But the rail and oil industries are fighting the tightest standards for any of these variables and so far it seems the Administration has not shown itself capable of fighting back. Nearly two years has passed since 47 people were killed in Lac-Mégantic, Quebec by a crude oil train carrying Bakken oil. Since then at least ten fiery derailments have occurred among countless other less dramatic spills and incidents. The regulator has so far failed to propose an adequate suite of measures that would fully protect the public. That the rail and oil industries are fighting any requirements that will increase their costs is standard practice, it will cost them money and the sociopathic nature of corporate behavior puts profits before the interests of society. But while the oil industry opposes stabilizing gassy crude oil, stronger tank cars and fast phase-outs for the existing stock of dangerous cars, the rail industry opposes better braking systems and stricter speed limits. Together they make a strong team of opposition to the range of safety measures that might be effective. A safety regulator under fire from the combined power of two of the most notorious and well-resourced lobby machines in the history of the United States is unlikely to come up with a solution that prioritizes the public’s interest. Beyond the urgent issue of the safety of hundreds of North American communities that live within a mile of the train tracks, some 25 million people in the U.S. alone, we urgently need to transition to a clean energy economy as fast as possible. The All of the Above energy policy that has brought us reckless crude-by-rail has been focused on pulling oil out of the ground as quickly as possible no matter the consequences, rather than transitioning us away from oil. That needs to change beginning with ending this dangerous practice. For the sake of a mere 4% of total petroleum passing through the United States, we say stop the trains now, protect North America’s communities and build an energy system that protects the climate and our citizens from a reckless oil industry. You all probably know by now that we helped write the bill that Senators Baldwin, Murray, and Cantwell released yesterday calling for an immediate halt to the use of all unjacketed DOT-111 rail cars. Yes, let’s stop this insane transportation of oil by rail. One of your jobs is to keep “we the people” safe and alive. The Clean Water Act of 1972 protects our waterways, which the bomb trains are threatening. The National Contingency Plan for oil spills is open for modification by the EPA until April 22, 2015. Please submit a comment to the EPA to tell them that we need a better contingency plan, better toxicity tests, better efficacy tests, enforced local involvement, only safe mitigation methods, and to support the ALERT plan. Go to http://www.alertproject.org to submit a comment to the EPA before April 22!